The Walrus, the Pacific Northwest classic rock band known for performing covers of the Beatles, Eagles, Queen and other rock 'n' rollers, has declared 2007 "The Year of the Walrus." The Walrus, which debuted its first CD of original songs, appropriately titled, 'Uncovered,' in November 2006, is making a post-holiday push to bring their critically acclaimed music to those who long for "original" classic rock. "People of all ages really appreciate classic rock music, and the only classic rock they can find is the old stuff," says Chuck Dingée, a Walrus guitarist and vocalist who has been playing in rock bands for more than 40 years. "That's why we have declared 2007 to be the Year of the Walrus." Dingée is also the soulmate, husband and first mate of Sheehan World publisher Kathy Sheehan, for whom the "Uncovered" song "Starcharter" was written. The Walrus CD, produced by tusktusk records, is available at numerous online sites, including at iTunes where Baby Boomers and other rock 'n' roll lovers can buy a song or the whole "Uncovered" album with their iTunes gift certificates. "Uncovered" features rock, pop and folk vocal arrangements and harmonies reminiscent of the Beatles and Crosby Stills Nash & Young combined with classic rock melodies inspired by music from the 1960s and '70s. Because there is little new classic rock available at a time when classic rock is experiencing a resurgence, the new album's availability is a welcome gift to multi-generations of fans of rock 'n' roll. "The songwriting is solid. … Clean, in-tune harmonies combine here with catchy melodies, a solid rhythmic base and some tasteful lead work," says Entertainment News NW. Of the 11 new songs on "Uncovered," seven were written by vocalist/guitarist Joe Young, a prolific songwriter who has played in numerous bands in the Midwest and the Northwest. Two songs were written by lead vocalist and keyboardist Jamie Shea, who has lived and gigged from Los Angeles to Seattle to Vancouver, BC., and two were written by Dingée whose acoustic guitar and rich "Beatles" voice has entertained audiences from Florida to Philadelphia and Chicago to the Pacific Northwest. Drummer Michael O'Neal and bass guitarist Walt Burkett provide the backbeat and also sing on the new tracks for these Rockin' Sea Mammals. "It's fun to play songs that people know and love because it's like they own a piece of that song when they sing along and join in," says Shea. 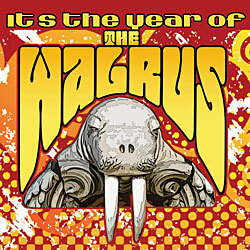 "Now we're heading into new territory with this new CD of original music and a New Year: The Year of the Walrus." Anyone with iTunes installed on a computer can go directly to the Walrus album on iTunes. Shea adds that the classic rock sound has an ageless popularity. "It's not only the Baby Boomers who can relate to the Walrus' classic rock style," Shea said. "Some of our most appreciative fans are kids in their 20s whose parents serenaded them with songs like the Beatles 'Golden Slumbers' instead of 'Rockabye Baby.' Given a choice between angst-ridden teen rock and over-produced pop, many young people prefer to turn to the more cheerful and down-to-earth classic rock groove." The new Walrus CD is bursting with rock harmonies and ballads about love, empowerment, cheating lovers and friendship. The songs range from "The Garden," inspired by the 1992 New Age novel, "Ishmael," and employing CSN&Y-style harmonies to the deliciously vampy "Tongue in Cheek" to the psychedelic-sounding "Gaia." Two songs are directly inspired by the Beatles, the Walrus' favorite band to cover. Young's "Abbey Road" describes the ups and downs of rock stardom, and "Hold Your Hand" is a 92-second dance number with harmonies as crisp as The Beatles' No. 1 hit, "All My Loving" (and reminiscent of a number of early Beatles songs including, of course, "I Want to Hold Your Hand"). In addition to the sound produced by current Walrus band members, haunting strains from the violin of the late Guy Mulford (known as Kathy's "other" husband) are heard on 'Guy's Song,' a tribute to the beloved musician who died on Jan. 1, 2001. 'Uncovered' can be purchased for $15 from members of the Walrus, at CDBaby; the Independent Artists Company; iSound.com; Bitmunk, Rhapsody, Napster, Amazon.com and at many music stores in the Pacific Northwest. It is also available for 99 cents a song or $9.99 for the whole album at http://www.apple.com/itunes/. For more information about The Year of The Walrus and the new CD of original classic rock music, go to www.CDBaby.com/cd/walrus, www.MySpace.com/iwalrus, http://blog.MySpace.com/iwalrus/ or www.tusktusk.com/uncovered. Print-quality photos of The Walrus are also available on PRWebPhotowire.com by searching for "Walrus" or "classic rock." 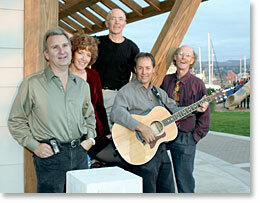 The Walrus will be performing Friday, Jan. 5 at the Wild Buffalo House of Music.